Outstanding 2 mile family hike to beautiful Sheep Lake. Great getaway for out-of-town guests. Great little family hike, easy hiking. About one hour each way. 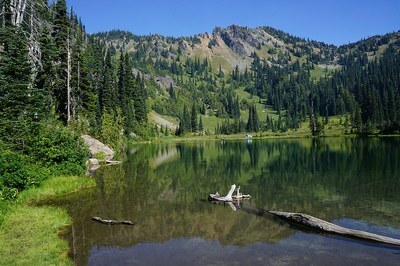 Trail head starts at Chinook Pass with excellent views on a sunny day. Very little elevation gain. Trail head parking pass required. Expect lots of hikers on the trail on sunny days.